Christmas is undoubtedly the best time of the year to visit cities that dress up to celebrate this family feast. As for Barcelona, it shows its charm even more between lights, markets and loads of traditions that we will describe below so you do not hesitate to take the car to Catalonia and enjoy some unforgettable days. About how to park in Barcelona, do not worry, it is also solved. Fasten your seat belts and let the journey begin! There are many reasons why we should let ourselves be captivated by Barcelona on Christmas. One of them is to be able to appreciate the great jewel in the crown, the Sagrada Familia, dressed up to celebrate, surrounded by markets, lights and even more lively streets than usual, with other additional attractions like the traditional (and essential) Fira de Nadal right in the square where the temple is located. But we didn't come to a Sagrada Familia parking in the midst of Christmas just for being seduced by the impressive Gaudí temple: the avenue that names the famous architect takes us directly to one of the greatest jewels of modernism: the Hospital de Sant Pau and, along the way, we can enjoy from a typical meal (canelones, sopa de galets, escudella...) to delicious nougat, cups of hot chocolate or other common Christmas time delicacies. And what about the center and its Ramblas! Ciutat Vella awaits us with one of the most emblematic walks in the world, decorated for the occasion. But the Christmas epicenter in Barcelona is just few metres away from there: the Fira de Santa Llúcia right in front of the cathedral. A traditional Christmas market in a unique environment. Buying a caganer at the Santa Llúcia market: if there is a typical Christmas souvenir in Barcelona that is the caganer, a unique figure from the Catalan cribs representing a shepherd boy in the act of defecation, whose particular iconography made it the most representative present target. 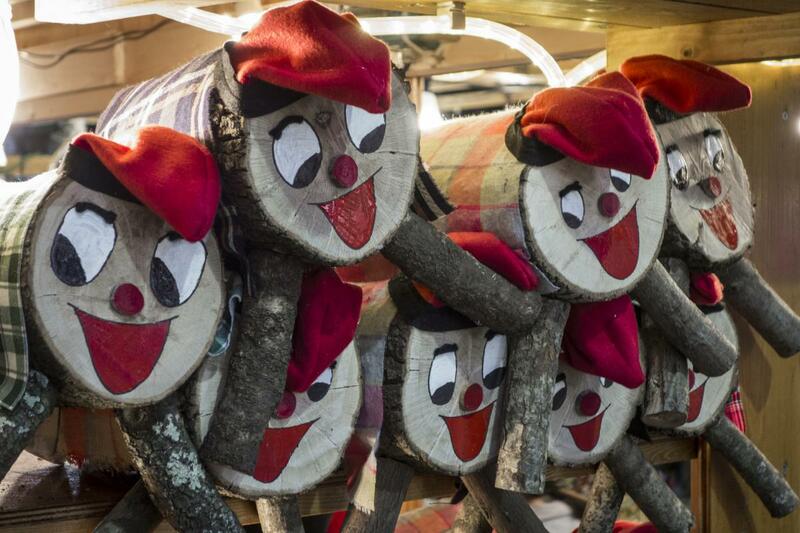 We can find from the traditional caganer (the shepherd boy) to the one representing famous football players, politicians or other "celebrities", among more than 200 stalls that are placed only in this magical corner of the city. Enjoying the nativity scene in Plaza Sant Jaume: every year, a nativity scene of considerable size is placed next to the City Hall and the Generalitat palace. It delights everyone who approaches this corner, halfway between the Cathedral and the Ramblas. Giving a cagatió: if the caganer is the protagonist of the Christmas souvenirs, the silver medal goes to the cagatió. It is a nice trunk, decorated with a blanket and a barretina (a little red sock hat), that is traditionally placed under the Christmas tree and filled with sweets and candies. The children collect these gifts on Christmas day performing a curious ritual. Do not hesitate to ask for it and about how to celebrate it. Seeing the Cabalgata de los Reyes Magos: January 5th is the most awaited day by the kids from Barcelona and by anyone who wants to return to childhood. It is the day in which the Three Wise Men travel through the streets distributing gifts, sweets and smiles to those attending this show of music, lights and color. Attending a concert or Christmas show: Barcelona is a very musical and theatrical city, so there will no lack of spaces where to enjoy two of the most representative works of these days: Messiah by Händel and Els Pastorets. About the first one, it would be a privilege if we have the opportunity to enjoy it in the impressive Palau de la Música or in the emblematic Liceu. As well as the pastorets show, a Christmas work par excellence representing the shepherds pilgrimage in search of the Messiah, that you can attend in civic centers and neighborhood markets. We say it from now: parking without reservation in the center of Barcelona is IMPOSSIBLE at Christmas. Celebrations such as the Santa Llucía market, the walk along the lighted Ramblas, the commercial centre of Plaza Cataluña - Portal del Angel..., there are too many stimuli concentrating in this charming corner of Barcelona (already crowded during the rest of the year), so if you do not want to despair, book a parking place with Parkimeter and get rid of stress. Searching for parkings in Barcelona neighborhoods: The city of Barcelona is particularly interested in moving its activities and livening its neighborhoods up, so an excellent idea is parking in Sant Antoni, searching for parking in Gracia, leaving the car in a parking in Sants, or in any one of 10 Barcelona districts. During your journey, there will no lack of plans and corners with Christmas charm.